Will having children make marriage last longer? Children, it is supposed, so enrich a marriage that it is more likely to endure over time. They bring a unique stimulus, necessitate close teamwork, and foster intimate communication. While some would argue that they could seek such stimuli elsewhere, and others would say that they can do without that sort of personal development, the naysayers are not strong enough to displace a nuclear family ideal that has persisted despite change in the 20th and 21st centuries. To many religions children are a natural extension of marriage. Why get married if not to have children? This thought has been reflected in tradition for generations. I can see the opportunity for survivor bias here. Those not in favour of having children will likely not breed, or reluctantly breed children who will not reinforce the tradition. With its vested interest in both marriage and children, it is unlikely that tradition will tolerate the idea of children destroying marriage. Children are good. Marriage is good. Ergo, children are good for marriage. With that assumption in mind, let us examine a data extract from National Health Statistics Report 49 March 22 2012. Probability that a first marriage will remain intact (survive) at specified durations among women aged 15-44 years, by selected characteristics: United States, 1995, 2002, and 2006-2010. The seemingly linear descent is not as bad as it looks because it does not eliminate couples that have already separated. 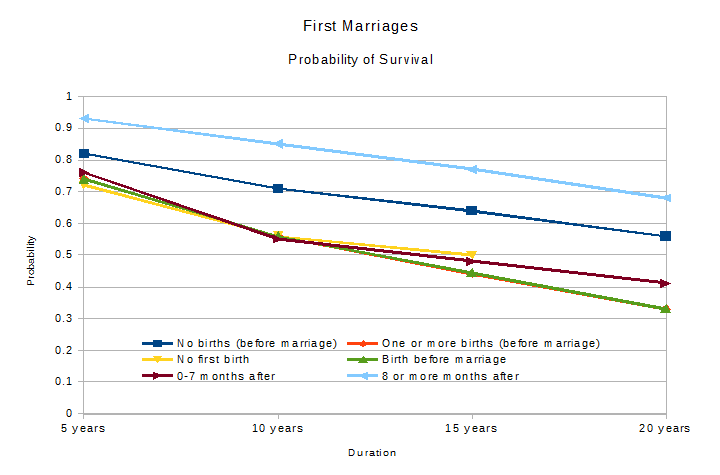 For example, No first birth couples have a 0.72 probability of lasting 5 years, but 0.56 probability of lasting 10 years. However, out of the same marriages that do last 5 years, there is a (0.56/0.72) 0.77 probability of it lasting to 10 years. Children correlate with longer lasting marriages, but only in very specific situations. Have a child before marriage, or through wedlock, and the chances are just as good as not having children at all. Over the longer term, it is even worse. This makes me wonder whether it is not children as such that make marriages last. It is too easy to put the blame on individuals by saying that anything but raising children in a first marriage evinces poor character. Marrying despite the presence of a child, and with the implicit agreement to help raise it, may be more noble than insisting on tradition. Refusing to have children may demonstrate self knowledge and a willingness to stand up to institutionalised norms. My first thought is that the extra societal support and approval that comes with falling into the ideal 'marriage, conception, birth' sequence makes things easier for families. Note that this does not conflict nor reinforce posts from one of my favourite blogs on whether childfree couples are happier, in that a marriage does not need to be happy in order to last. Children, under the correct circumstances, keep both happy and unhappy parents together. Will you still feed me when I'm 六十四?